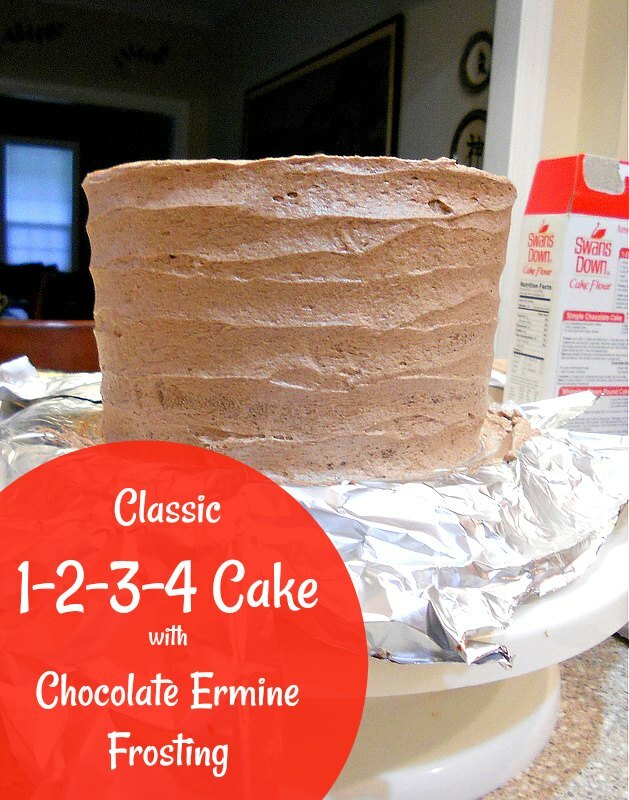 Enjoy this classic 1-2-3-4 cake recipe with my chocolate ermine frosting or with your favorite frosting! The Beloved’s lovely boss emailed a few days ago asking if I would make a small birthday cake for one of their coworkers. I said “Sure! And worry not about paying. It’ll be fun.” Well, if you followed along yesterday, the baking wasn’t exactly fun. Some of it was the Opposite of Fun, but that’s okay because sometimes we just have One Of Those Days. And I learned something, too. I learned from fan and able pastry chef Marie that the Angel Tears Frosting is really called Ermine frosting. I still kind of dig the name Angel Tears Frosting, but there is a lot more good information out there on Ermine Frosting than there is on its generic name: flour-based frosting. 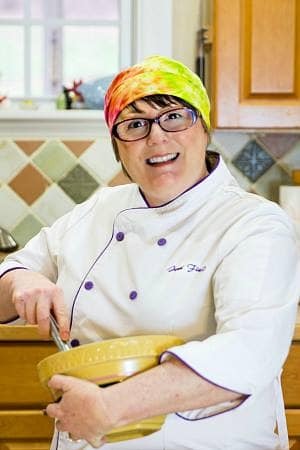 As a matter of fact, I found this excellent article on It from a blog called Culinary Alchemy written by a delightful guy named Shane. OK, back to the cake (along with some lessons learned along the way). 2 What Happens if I Overfill My Cake Pans? You’ll also need 1 level teaspoon of fine salt and 3 teaspoons of baking powder (1 teaspoon per cup of flour), 1 cup of milk and enough vanilla to make it taste good, probably 2-3 teaspoons of vanilla. Another thing about the batter for this cake: it tastes exactly the way cake batter ice cream wishes it tasted but doesn’t. If you are a Fan of Batter, make sure you use really fresh eggs, because you will want more than just a Wee Taste. This makes a Rather Lot of batter. The original recipe, slightly adapted from Carole Walter’s Great Cakes cookbook calls for this to be baked in a 10″ tube pan. 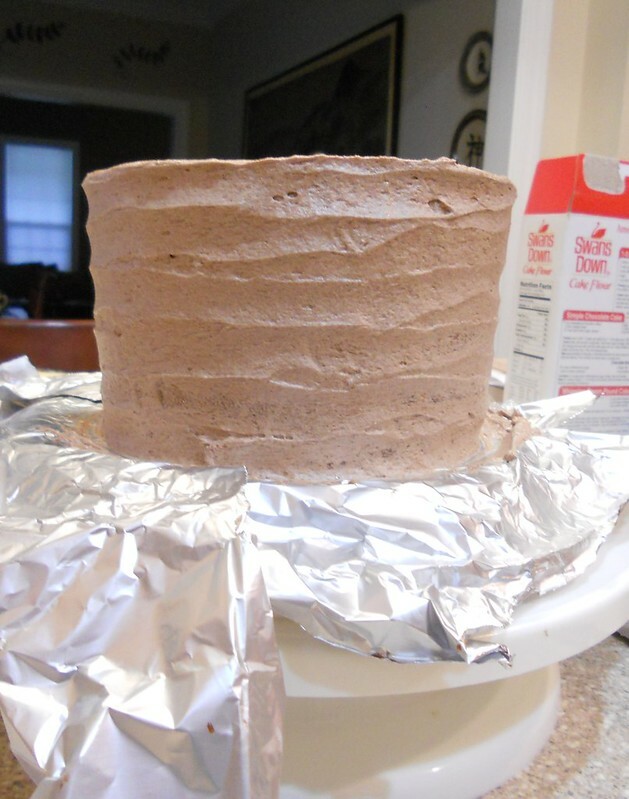 If you’re going to bake layers, I’m guessing it will make 2 9″x2″ layers. Make sure you’re baking in pans with 2″ sides. Those 1 1/2″ jobbies from the grocery store won’t hold it. And if you have any question about whether all the batter will fit into your pans, err on the side of caution and bake a couple of cupcakes, too. Fill your pans only half full. Trust me. If you do forget and fill them too full, there is help for you. This is the advice I gave folks on facebook yesterday. Behold, it stands the test of time. Because it is still true today. What Happens if I Overfill My Cake Pans? If your cake batter looks like it’s going to spill over, Do Not Panic. Repeat: Do. Not. Panic. Put a cookie sheet under the bottom rack (spray it w/Pam first if you think of it, or line it w/parchment. Don’t worry if you don’t though). Let the cake do its thing and keep telling yourself that what’s in the pan is just fine, because it totally is. Just fine. If the top of the cake starts browning too much, just cover it loosely with a piece of foil and turn the heat down by 25F. Continue baking until the cakes test done. Remove from the oven and, using an icing spatula or the back of a knife, trim the overflow off right at the inner edge of the pan. Do this right after you take it out of the oven since the cake will shrink as it cools and you don’t want it to pull away all jaggedy and weird. Let the cake cool in the pans for 10-15 minutes and then turn out on racks. Wrap tightly in a couple of layers of plastic wrap and put them in your freezer. Once cool and semi-frozen, use a serrated knife to trim any crunchy bits off the top (bottom) of your layers, split them if you want, and continue w/icing and decoration. Pretend the horror never occurred, and pay a neighbor’s kid to clean your oven for you if you forgot to put a drip pan in there. OK, on to the 1-2-3-4 cake. For more lessons, read on at the end of the recipe. Nutrition information is based on cake plus frosting and not the cake alone. Looking for more old fashioned cake recipes? Give my Butterscotch Cake a try. You won’t be sorry! If you like the sound of this classic cake recipe, please rate and/or comment. I love to hear from readers! And if you make this cake, please share a photo with me on Instagram using hashtag#pcorecipe or on the Pastry Chef Online facebook group. I can’t wait to see your version! The Birthday cake childhood dreams are made of, if childhood dreams of birthday cakes include the best yellow cake and the fluffiest chocolate frosting. For the best and most stable emulsion, make sure all your ingredients are at cool room temperature. Spray 2 9"x2" cake pans with pan spray. (Or pan size of your choice. I used 2 6"x2" pans plus a cookie sheet). Line the bottoms with parchment circles and set aside. Use The Creaming Method to make this cake. Add the salt, vanilla and sugar and continue to cream until very light and fluffy. Scrape the bowl and beater as necessary. With the mixer running, slowly drizzle the eggs in, a bit at a time, until completely incorporated. This should take about 5-6 minutes. Scrape the bowl as necessary. Add the dry ingredients alternately with the milk: 3 additions for the dry and 2 for the milk, beginning and ending with dry. Do this on low speed and don't take longer than a minute for the whole process. Scrape the bowl as necessary. You may have to finish mixing by folding with a spatula, but that's okay. Better than than over-mixing your batter. Scrape into the prepared pans. Do not fill them more than half full. If you have extra batter, make a few cupcakes. Bake the pans in the center of the oven until they are well risen, firm to the touch and and a lovely golden brown. A tester inserted into the center of the cake should come out clean. Depending on your oven and pan size, this could take anywhere from 35-45 minutes or longer, so keep an eye on them. When done, remove from the oven and let sit on racks for 10-15 minutes. Turn out on racks, wrap tightly in plastic wrap and either let come to room temperature or put them in the refrigerator or freezer for more rapid cooling. In a medium saucepan, whisk the flour and cocoa powder together with a small amount of your milk to form a paste. Add the rest of the milk and the sugar to the pot and whisk over medium heat. Add a heavy pinch of salt and taste. Adjust if necessary. The proto-frosting will be very sweet, but worry not. It will balance nicely when you add the butter later. Bring the milk mixture to a boil, whisking constantly. Whisk for another 30 seconds to a minute and then remove from the heat. Pour into a metal bowl to cool. Whisk occasionally until the mixture reaches room temperature. You can speed this up by refrigerating the mixture. Fit your mixer with the whip attachment. Whip the butter until light and fluffy. Add the chocolate mixture, a couple of tablespoons at a time, making sure each addition is incorporated before adding the next and scraping the bowl as necessary. When cakes are chilled, slice off any dome and reserve as a snack. Slice each layer in half horizontally. Spread a layer of frosting about 1/4" thick on a layer. Top with the next layer and continue layering until you run out of cake. 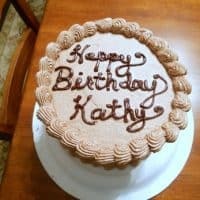 If your frosting is soft and your layers are sliding, wrap the whole cake in plastic wrap and refrigerate for about 30 minutes so the frosting firms up. *I also added a couple of handfuls of chocolate chips to the milk mixture once it came off the heat. I've decided this was a bad idea. Although the frosting tasted great, it was kind of speckled. Next time, I'll just stick to straight cocoa powder. If you're going to make cookies with extra batter because it sounds like a good idea, make sure to make them fairly small and bake until crunchy. If you leave them cake-y, they will be too delicate to be called cookies. They'll be Very Thin Layers of Cake. And crunchy cake batter is fantastic, so bake them until golden brown and hard. So, despite some Growth and Learning Opportunities, all’s well that ends well. I just spoke to The Beloved and the cake was a hit. I’ve shared, now it’s your turn. What have you learned the hard way in the kitchen? Thanks for reading, and I hope you have a lovely day. PS No ermine (ermines?) were harmed in the making of this cake. I have a birthday coming up and will be making this cake. Question, will I find sea salt at the grocery store or do I process it in the food processor? PS: If this were my cake, I’d have 2 wishes as I blow the candles: 1) I wish it were June, my birthday and 2) I wish I lived next door to you ! Delicious is the only word necessary to describe this cake. Oh, Easy might be another for making it. Can’t wait for my guests to try it on Saturday. Wonderful, Jo-Anne! I do love this cake–like a cross between a pound cake and a “regular” yellow cake! I’m sure your guests will love it! looking for a new chocolate cake recipe to make for tonight – and of course, been stuck on your blog for over an hour now. THIS is exactly the type of post that I was referring to in the survey – I learned couple of things just from this one – I now know how to trim up a cake after overflow disaster! ok – back to the chocolate cake search. . .
Yay! Have you considered the chocolate stout cake? That thing is amazing and doesn’t require a mixer. If you don’t want to make it with beer, you can always make it with coffee instead: https://pastrychefonline.com/2013/03/19/stout-cake-and-burnt-caramel-buttercream/ If you don’t want to deal with that buttercream, cream cheese frosting or ermine would work, too. Enjoy! I saw a few similar recipes only difference is that they have about 2oz vegetable oil in it. can u explaind the difference? Oil in both the cake and the frosting, Grace? I’m not sure, but I can make some educated guesses. In the cake, subbing in liquid fat for part or all of the solid fat mean that the texture, expecially when chilled, will be softer and the cake will “read” as moister. I am not sure about in the frosting, but now I want to try it out and see what happens! This Cake was the Standard Cake in our house when i wX growing up! 70 years ago! Mom would vary it by tweeking the flavor ingredients a bit , coming up with a Spice Cake, Orange Cake, Rum Cake, Jello Poke Cake, Coconut Cake, Lemon Coconut cake, Almond Cake, and Strawberry Cake! Baked in either a Tube pan or 9” layers ( more yummy icing and fillings with the layer version : ) ! i even added my own version whe i added Vanilla and Rose Water for flavor! This 1234 Cake is a Timeless Treasure ! Vanilla and rose water sounds like an especially lovely combination, Kathleen. I appreciate your taking the time to comment! So many ways to vary it, and thank you so much for pointing it out. I take for granted that you can make tweaks, but not everyone does. Makes it so much easier than having to remember 12 recipes. Just memorize the base for 1-2-3-4 cake and have at it! 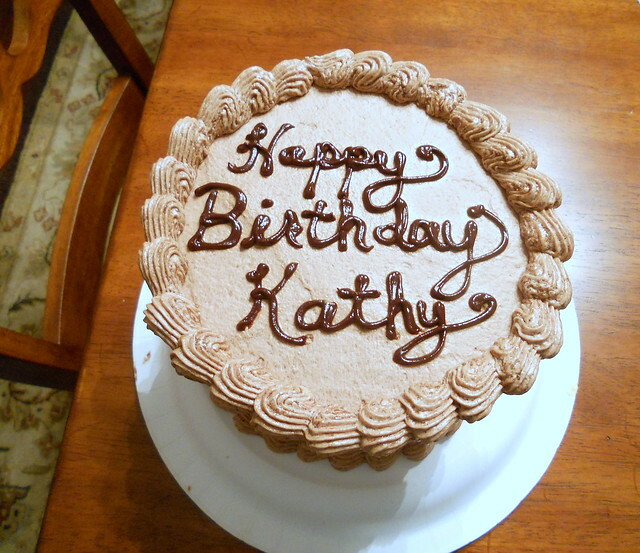 I love this cake for birthdays. So very good!